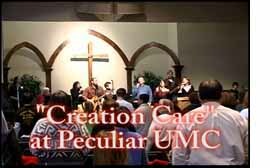 Pat Watkins, a United Methodist Missionary with at appointment to “Creation Care” was the keynote speaker at the 2009 Show Me Creation Care Conference, held at Community United Methodist Church, in Columbia Missouri.Â This MissionCast gives a quick overview of the conference.Â For Creation Care resources call the Office of Creative Ministries at 573-474-7155 or email williams@umocm.com or oliver@umocm.com.Â Resources may also be found on the website of the United Methodist General Board of Church and Society.Â That web address is http://www.umc-gbcs.orgÂ One of the worksho leaders was John Hill, from the Board of Church and Society, in Washington, DC. 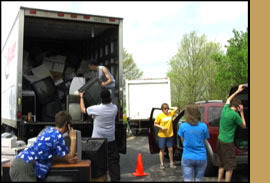 For a CBS special report on how some United Methodist Church are going green click here. To View MissionCast click on the picture or on one of the links below. Download the High resolution video to project on a screen during worship or at a meeting. A MissionCast is a 2 to 3 minute mission video added to the Internet every Monday morning.